Marketing Tools that Grow your business and build relationships. WEB-FIRST through Genkan Creative generates “your brand” public web site quickly and efficiently which is attractive, easy to navigate, and user friendly integrating the GENKAN reservations and Booking engine. This “public” website is search engine optimised and can even be totally re-branded to enable re-purposing of your property information for your 3rd party travel agents and affiliates of your business or your agents business. 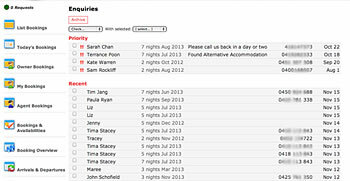 genkan reporting puts your reservation staff in a proactive position. After an online quote is made, the system automatically creates a dynamic content rich customized travel itinerary/brochure for your customer that can be viewed online or emailed to them. Professional email response delivered within minutes of receiving an inquiry. Quote of total cost included based on dates entered in inquiry contact form. Photo of property embedded in body of email, not as an attachment. 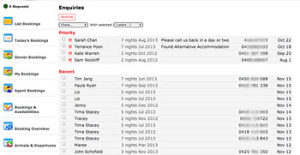 Availability response integrated with your property management software. Customizable content to market your properties best features. Advertise specials easily! Custom URL link that sends inquirer directly to your company website to book property. Option to include customizable property rules and requirements. Instant Software management system integration for real time data sync. Automated response, for booked properties, offering your inquirer alternative property choices with quote and picture included. Our e-messaging solution helps marketers like you to deliver powerful email, SMS, social and lifecycle campaigns for your property management marketing genkan web marketing features are fully functional and advanced and feature, WEB-FIRST and EMAIL-FIRST. genkan property management marketing provides easy to build and edit email or SMS marketing campaigns personalised directly from your genkan database. 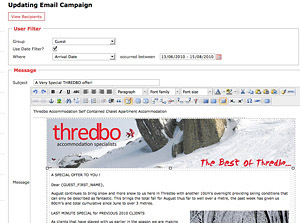 genkan has an inbuilt email marketing engine and with a simple WYSIWYG editor almost anyone with word processing abilities can create superb HTML rich text and images email campaigns. You can easily create sophisticated third party (affiliate) and internal distribution programs. Website content and business rules can be filtered by private label so you can create and build many private label branded websites catering to your specific target markets. You can even set different default sell price currencies so you can effectively market internationally.